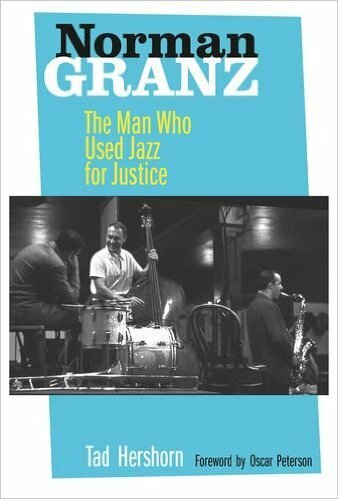 This book is important not because it is well written; it is important because Norman Granz was one of the most significant people in jazz. He did not play but the music he created through his record labels will live as long as jazz. The labels: Verve, Pablo, Clef and Norgran were his way of showcasing the jazz artists that he admired. A giant sound gallery of jazz: Louis Armstrong, Ella Fitzgerald, Count Basie, Louie Bellson, Benny Carter, Buck Clayton, Buddy DeFranco, Roy Eldridge, Herb Ellis, Tal Farlow, Stan Getz, Art Tatum, Dizzy Gillespie, Lionel Hampton, Coleman Hawkins, Johnny Hodges, Billie Holiday, Illinois Jacquet, Hank Jones, Gene Krupa, Anita O’Day, Charlie Parker, Joe Pass, Oscar Peterson, Flip Phillips, Bud Powell, Buddy Rich, Slim Gaillard, Ben Webster and Lester Young. Granz treated the musicians as artists who were equal to classical musicians. He paid them well and treated them with the respect due to great artists. He booked them into the best venues and they lived in the best hotels. Granz was political from the outset and he remained so. One of his first concerts was set up at Billy Berg’s club in Los Angeles. Granz insisted that the whites-only policy was removed before he would use the club. Later in his career he refused to use casinos and clubs in Las Vegas. Granz argued that it was wrong to have musicians playing at a venue when the same musicians could not enter through the front door or enjoy the facilities of the club. Granz made them change. Granz started his working life at MGM as a film editor. But he loved jazz and jam sessions. In July 1944 he booked the Philharmonic Hall in Los Angeles. The concert was a success and the name Jazz At The Philhamonic (JATP) was set and from the end of the war until 1957 his JATP touring groups travelled across America. The shows continued in Europe until the 1960s. A JATP concert was simple. Granz hired leading musicians and encouraged them to play as though they were in a jam session. The resulting music frequently lacked taste but it did give audiences across the world a chance to see and hear musicians that they had only read about or heard on records. Musicians were grateful for the work. Lester Young, Roy Eldridge and Coleman Hawkins whose careers had been badly affected by the advent of ‘modern jazz’ were given a new platform. Granz above all made jazz popular. He used his money to take on recording projects that he thought were important. Granz knew that Art Tatum had been disgracefully neglected on record. He contracted Tatum and gave him the freedom to play. Sixty eight solo tracks were recorded in two days, all but three of the tracks in one take. Granz ended up with eight albums and the gratitude of all who loved Tatum. One artist who Granz promoted extensively was Ella Fitzgerald. Ella had been badly treated by her recording company and was not recorded sympathetically. Granz bought out her contract and for him she recorded the Songbooks a series of CDs of the great song writers. Billie Holiday was recorded at a time when no one else would take the risk. Granz did not like artists to stagnate. He thought that Count Basie had settled into a routine so he challenged the pianist by placing him in different environments: teaming him up with Dizzy Gillespie, Oscar Peterson, Zoot Sims and simply as a soloist. Jazz made Granz rich. His wealth meant that he could record musicians who he admired. However, the one musician who escaped him was Duke Ellington. Hershorn notes that the two egos collided. Some of the correspondence between the two men is bitter. Granz never got the Ellington band into the studios. They accompanied Ella Fitzgerald once and Granz recorded the band when they were on tour. He constantly criticised the latter day Ellington for re-cycling old hits and he longed to provoke Ellington into creating new work. It was only right at the end of Ellington’s life when he persuaded the Duke to recreate the Jimmy Blanton sessions with Ray Brown. In the early sixties Granz became disillusioned both with jazz and the USA. He saw that his crusade against racism was getting nowhere and that racism was still a corrosive force in the US. Jazz, Granz felt, was starting to turn its back on audiences. He left the US and went to live in Europe. He still organised tours with Ellington, Miles Davis and John Coltrane. One of the fascinating aspects of Granz’s life in Europe was his increasing love of art and the relationship that he had with Picasso. The Spanish genius trusted Granz who bought many of his paintings. Granz had always loved art. His early LP covers featured work by the graphic artist David Stone Martin. Hershorn paints a warts and all portrait. Granz could be brutal as well as amazingly generous and there are many examples of that in the book. The complexity of Granz is shown clearly. Hershon, in spite of the wealth that Granz amassed, shows that Granz was not self-seeking; he thought that the artists that he worked with were the important ones. A reader might complete the book and wonder if jazz would benefit from a modern day Granz or if the jazz world has changed too much, become too diffuse, too happy to accept the minor role that society has granted it.